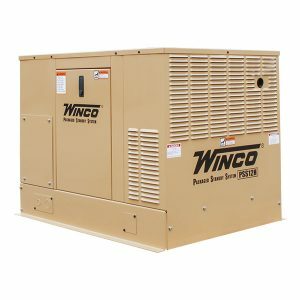 The WINCO HPS9000VE tri-fuel generator is a great value by combining great components and excellent electrical performance. The Briggs and Stratton Vanguard is commercial grade and designed to hold up under the most demanding conditions. The V-twin 480CC engine design provides smoother power than single cylinder engines. 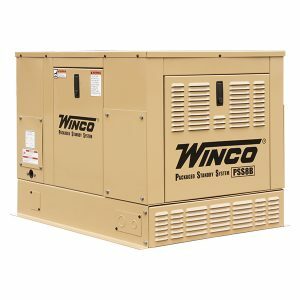 This generator produces 8000 watts of power and at less than 5% total harmonic distortion is safe for sensitive loads like furnaces, TV’s and computers. Battery – 12 Volt U1 300 CCA – 17 Lbs. Maintenance Kit – 16200-007 (Includes air filter, spark plug, oil, Sta-Bil Fuel stabilizer & oil filter). 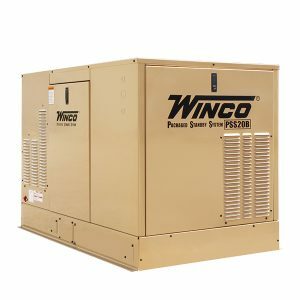 Package Deal – Includes: Generator, gen cover, dolly kit, low pressure fuel solenoid, manual transfer switch & battery charger. You save $114! Tri-Fuel - Designed to easily run and transition between three fuels; natural gas, LP Gas and gasoline. Sturdy Wrap-Around Welded Tubular Cradle - Winco uses 1"-14 gauge steel for dependable durability. Premium Square D Circuit Breakers - Square D is the industry leader in circuit breaker protection. Canvas Generator Cover - Storage can be hard on your generator. Moisture and dirt can damage the engine and generator windings over time. Often during transport and storage the generator is damaged by scrapes and dents. 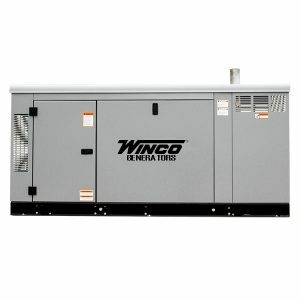 Winco's heavy tailored canvas cover will protect your generator from these hazards protecting your investment. A built in band keeps the cover in place. This cover is for generators with 2-wheel dolly kits installed. 3 Lbs. Emergency Transfer Service Kit 60/30 Amp - Allows your portable generator to be quickly and safely connected to a building electrical panel for backup service during a power outage. A hinged lockable enclosure contains a 12-foot cord with a NEMA L14-30 twist-lock plug and stores the cord set when not in use. A quality Square D circuit breaker load center with interlocked generator and utility main breakers to prevent feedback to the utility, installs next to the building electrical service panel. Four 120-volt (or 8 tandem) or two 240-volt branch circuits or a combination of the two can be connected for emergency service. This manual transfer switch is not UL listed. 45 Lbs. 30 Amp Locking Plug - (NEMA L14-30) The 30 amp twist-lock plug is perfecting for running power into a transfer switch or other distribution box. The cord is sourced locally and specifications should be determined by a competent electrician taking distance, load, and other environmental factors into account. 1 Lb. Low Pressure Fuel Solenoid - The solenoid kit is designed for tri-fuel generators that will be left unattended while connected to the fuel supply. The normally closed ASCO valve interrupts the fuel supply whenever the generator is not running preventing fuel leaks. 4 Lbs. Battery - 12 Volt U1 300 CCA - 17 Lbs. Maintenance Kit - 16200-007 - Your generator requires regular maintenance. 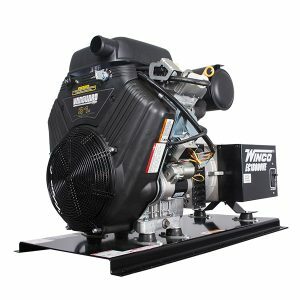 Our kits provide all of the necessary products to ensure your generator is ready when you need it most. (Includes: air filter, spark plug, oil, & Sta-Bil fuel stabilizer &amp; oil filter). 6 Lbs. Package Deal - Includes: Generator, gen cover, dolly kit, low pressure fuel solenoid, manual transfer switch &amp; battery charger. You save $114!